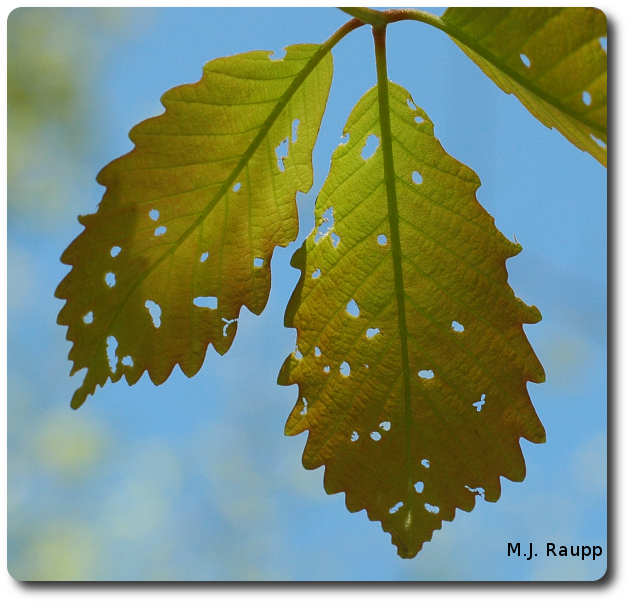 Young gypsy moth caterpillars make small holes called shot holes in leaves when they feed. Later entire leaves will disappear. In recent weeks billions of tiny gypsy moth larvae like these two hatched from egg masses. Each egg mass may contain more than a thousand eggs. One of the key factors holding the gypsy moth at bay is a fascinating fungal disease called Entomophaga maimaiga. This fungus is native to Asia and was released in New England. In 1989, an epizootic ofEntomophaga decimated gypsy moth populations in seven northeastern states and spread throughout much of the gypsy moth’s range. Unfortunately, much of the country including Maryland has been wrapped in drought for several years and drought is the enemy of fungus. It appears that the recent increase in gypsy moth in our region may be linked to a weather-related decline in Entomophaga. With the return of wet weather this spring, we hope to see a return of our fungal friend which may translate into lower populations of gypsy moths. In the meantime, now is an excellent time to inspect your trees for gypsy moth caterpillars. Look for small irregular holes in the surface of the leaves. These “shot holes” are diagnostic for the presence of young gypsy moth caterpillars. Over the next several weeks, these tiny (<1”) hairy black caterpillars with a bit of brown on their back will grow into leaf-eating machines capable of consuming a square foot of foliage each day. Aficionados of the Fantastic Four will remember the battle cry of the Thing: “It’s clobbering time”. Now is an excellent time to clobber gypsy moths on your trees. But what insecticides should you use? One of the safest insecticides around is Bt. This microbial marvel is derived from soil dwelling bacteria and it is especially safe to humans, pets, and beneficial insects such as pollinators and natural enemies of pests. Bt will be used by the state of Maryland for much of its large-scale gypsy moth suppression. I treated pesky caterpillars we visited recently including euonymus leaf notcher (LINK TO APRIL 13, 2009) and eastern tent caterpillar (APRIL 6TH, 2009) and found Bt to be highly effective at killing caterpillars, especially small ones. Other insecticides in the “green” genre that brought an untimely end to my unfortunate test subjects include insecticidal soap, and products containing the active ingredients spinosad or pyrethrin. I purchased all of these products in a local garden supply store. Best results will be had if you thoroughly wet your plants and the offending caterpillars. As with any insecticide, always read the label and carefully follow all directions. A simple, green, and foolproof way to clobber a few gypsy moth caterpillars on a small tree or shrub is to simply put on a pair of gloves and crush the little rascals or knock them into a pail and destroy them. For trees too large to be safely treated by do-it-yourselfers, the best bet may be to hire a certified arborist. These professionals have the tools and talents for dealing with egregious pests of your trees. Other self-help methods for reducing gypsy moths on your trees are contained in the publications and at web sites listed below. Happy clobbering! Bug of the Week thanks Dr. Paula Shrewsbury and Marvel Comics for inspiring this week’s episode.